One thing I love about the teaching of Jesus is His use of metaphors and stories. In John 10, Jesus states that He is the Good Shepherd (John 10:10), and He compares us to sheep. As I’ve been thinking about sheep, I discovered some random facts about them that help me understand why Jesus used them to describe us as humans. Did you know that sheep are fearful and easily panicked? Who knew? No wonder Jesus used them to describe us! In our humanness most of us are fearful. In fact, that is the number one concern I hear from women and men as I travel the world. If panicked, an entire bunch of sheep is easily prodded into a stampede. They have a mob mentality. When sheep know the shepherd’s voice, his voice calms their fears and settles their panic. This is why Jesus said, “His sheep follow Him because they know His voice” (John 10:4). Did you know that sheep get jealous easily and push for dominance? Sound familiar? Maybe this hits too close to home, but it’s so easy for us to become envious of others, isn’t it? This is the cry behind “That’s not fair!” Our human tendency is to want life to be fair. If our friend has a beautiful home, we want one too. If our co-worker gets a raise, we want an increase as well. Here’s the thing: according to the parable of the Vineyard, (Matthew 20:1-16) our Christian walk was never meant to be “fair.” If it was fair, we would all deserve hell, right? Praise God that isn’t the case!! One of the most convicting stories of Scripture is when Jesus sits on the beach with His disciples after His resurrection. After He re-commissions Peter, He tells Peter how he will die. Peter looks at his friend John and wonders if his death will be easier—he blurts out to Jesus, “What about him?” Jesus replies, “If I want him to remain alive until I return, what is that to you?” (John 21:15-22). Ouch! I love this story because it reminds me that I must never sink to comparing my life to another. In Jesus’ kingdom, life may not seem fair, but it is good. Our quest for fairness will rob us of the abundant life Jesus promised His sheep (John 10:10). Did you know that sheep are creatures of habits and they are resistant to change? Many of us are creatures of habit as well. When God calls us to shift our thinking or embrace change, we panic or pout. As our Good Shepherd, Jesus knows if we are going to live life to the fullest we must keep being transformed. The truth is we can’t be transformed without change. Friend, understanding out similarities to sheep can help us focus on the Shepherd and learn to trust Him more fully. 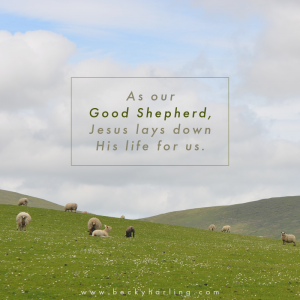 As our Good Shepherd, Jesus lay down His life for us. He’s thoroughly committed to us. He loves us completely. We can trust Him to lead us and protect us through every changing season. Why not take a few quiet moments and read through John 10:1-18? Make a list of the character traits of Jesus as your Good Shepherd. Then spend some time praising Him that He loves you completely and that you can trust Him. This week I’m home preparing messages! Please pray as I am working on preparing 12 messages for upcoming events over the next few weeks. Pray that the Holy Spirit will pour out His thoughts and that I will listen well to His voice as I prepare. Please pray for good rest while I’m home.